The origins of the Law Offices of Stephen J. Dunn date back to 1988 when Stephen J. Dunn, the managing attorney, opened a solo law practice in Towson, Maryland. Since then the firm has grown to a national level with offices located in Maryland, Pennsylvania, and Arizona, representing federal workers and government contractors nationwide. Our firm has served federal workers and government contractors with their unique legal problems for over 25 years while Stephen J. Dunn has practiced in these areas of the law for over 30 years. 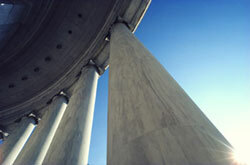 We strive to fully serve Federal Employees in their legal needs. Often the interests of Federal Agencies are adverse to the interests of Federal Employees. In fact, when it comes to Workers’ Compensation, the employing Agency is required to pay the Office of Workers’ Compensation the amount paid to the Employee in benefits. It is not in the Agency’s best interest to ensure that Federal Employees know their rights and exercise them. Our law firm will advise you of your rights and work to protect them every step of the way. At the Law Offices of Stephen J. Dunn, we will advise you, the Federal Employee, of the proper way to proceed with your case and indicate the most effective action required to get you what you want. We provide quality legal services which are focused on solving our clients’ problems at the lowest level possible. This preventative-law approach saves our clients time and money in the future, preventing further appeals. We take pride in the fact that most of our clients are referred by other lawyers and satisfied clients.